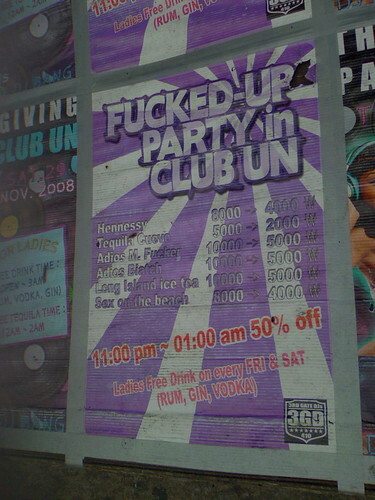 It's good to know that whoever runs Club U.N. has customers' best interests at heart and is willing to offer reasonably priced cocktails as well as free drinks for the ladies. A Tequila Cuevo is very reasonably priced at 2000 won, but even more intriguing are the "Adios M. F***er" and "Adios Biatch" concoctions at only 5000 won apiece. A quick google search brings up a number of recipes for Adios M. F***er, but nothing for Adios Biatch. I feel like I'm somehow missing out. Guaranteed to give you a wonderful experience. Try one today!